What Gets Recognized Gets Done! RCB Awards Blog: What is recognition? What is the impact of recognition in our careers? A look at how to make an effective award presentation, implementing recognition programs, understanding tax laws, creating wording, inscriptions for plaques, crystal, famous awards and some interesting recognition news. For more information, call RCB Awards at 1-800-929-9110. We give an award to the top sales guy, to the person with 25 years of service, to the truck driver with 1 million miles without a chargeable accident. We believe in the power of recognition. The why we do it may seem obvious, but it is a lot more than that. Create a culture within the company that affects every attitude. Say thanks and applaud success. Teach others what we as an organization want to achieve. In summation, we believe in using recognition everyday to improve the bottom line. If that's important to you, then we're speaking the same language. Come with us on this journey. Take a look at the topics we have and see if we can help you with your recognition programs. Need ideas for wording on an awards? See the Thesaurus. Want to implement a sales award program but need to present the concept to management? Check out Sales Awards: An Overview. Want to know the inside scoop on the Lombardi Trophy or the Oscars? Take a look at our ongoing series on Famous Awards. Talk to us. We are here to help you. Research shows companies find a balance of formal and informal recognition is an effective way of keeping employees motivated and happy. According to Greg Boswell, OC Tanner Recognition Company, the move to make informal recognition part of a corporate recognition strategy has been due in part to companies that are working to improve employee retention. In a study conducted by Robert Half International, 47 percent of executives surveyed said that recognition and praise were the most important factors in keeping an employee satisfied. However, it’s often through formal programs such as career achievement or employee service awards, management can implement communication tools and effective training with the power to impact the entire company. “Formal recognition has the unique potential to tie every employee’s achievements to a company’s values and business goals,” said Boswell. “With ongoing formal recognition as a foundation, informal programs can be added to encourage spontaneous appreciation." Regardless of the size of the company and the scope of the work, all employees deserve the chance to be acknowledged for their contribution to the success of a company. It’s clearly a win-win situation for business, when people feel valued, they feel better and they perform better. Not to mention how good it feels to be the giver. For more information, contact RCB Awards at 800-929-9110. 33% of people receiving cash awards will use it pay bills. 20% of people will not recall what they used a cash award for. It is considered income and seen as an entitlement, so it is not as effective as a tangible award. For more information, contact RCB Awards at 1-800-929-9110. And the Winner is... How the Oscar is built. Its official name is the Academy Award of Merit, but the origin of the less cumbersome nickname "Oscar" is not clear. For years, Bette Davis claimed to have coined the name when she quipped that the statue's backside resembled her husband. However, Davis recently relinquished her claim when references to the moniker were found in print three years before her 1937 win. Bruce Davis, executive director of the Academy of Motion Picture Arts and Sciences, has been trying to solve the mystery. "I had three claimants," he said. "I was able to disprove two, but I find the third one rather suspicious, which is a very unsatisfying conclusion." The preferred story is that in the early '30s, Academy librarian and eventual executive director Margaret Herrick commented to staff that the statuette resembled her Uncle Oscar - and the nickname stuck. Officially, the Academy started using the name in 1939. "The Oscar is better now than it was 25 years ago because the gold content has been increased," says Owen R. Siegel, founder and CEO of R.S. Owens & Co., manufacturer of the statuettes. "I believe the Oscar contains more gold than any other famous award." The specific dollar value, however, is a secret: "The Academy wants them to be considered priceless," says Siegel. But because of the simple design, he confides, "If there was no gold, they'd be worth less than $100 each." Each statuette takes 10 people and about 5 1/2 hours of labor to make, close to an hour in polishing alone. "Though we could probably do it quicker, we take three to four weeks to cast 50 statuettes," says R.S. Owens spokesperson Noreen Prohaska. "It may sound silly but each one is done to perfection and handled with white gloves. After all, look at the people who will be clutching it on Oscar night." The special care is not wasted on Bruce Davis, who first watched the manufacturing process about two years ago. "I was very impressed," Davis says. "I knew it was a complex process, but to see it done with such care was very reassuring." The Oscar stands 13-1/2 inches tall, not including the 3-inch base, and weighs a deceivingly hefty 8-1/2 pounds. The figure is hand cast in brittanium - an alloy of tin, copper and antimony that is much like pewter - in a 45-pound steel mold. The statuette is then deburred, degreased and polished to a mirror finish. "We spend about 45 minutes just polishing each one," Siegel says. Several layers of metal plating and polishing between each application give the statuette its perfect finish. The brittanium cast first receives a light copper electroplate, then heavy copper. Nickel plating is applied to seal the pores of the metal. Then the statuette is washed in silver-plate, which adheres well to gold. Finally, after more polishing, the statuette is plated in 24-karat gold and receives a baked lacquer finish. Of course, they're not engraved until later because the winners are top secret, even to the people who polish and primp the Oscar. R.S. Owens receives the list of winners only after the ceremony, then engraves the plates to ship back to Hollywood. The idea for the Oscar was hatched in 1927, when then-MGM President Louis B. Mayer proposed that the one-week-old Academy create a special film award. Cedric Gibbons, MGM art director, and sculptor George Stanley are credited for the design - a knight holding a crusader's sword standing atop a reel of film whose five spokes symbolize the five branches of the Academy: actors, directors, producers, technicians and writers. Unlike many other big-name awards, the Oscar has changed very little since its birth in the late '20s. The design has remained identical except for slight variations in the base, which was originally slightly smaller and made of Belgian black marble. Even the base - now made of spun brass and plated in black nickel - hasn't changed for 53 years. The only other variations were in materials. For the first three years, the statuettes were made of gold-plated solid bronze, which was changed to brittanium to ensure a flawless finish. Later, during World War II, the statuettes were cast in plaster when manufacturing with metal was restricted. But the plaster casts were replaced quickly after the war. All of the plaster versions were thought to be lost until recently when one was discovered in the Academy vault. More than a half century later, it's amazing any survived. "I imagine the Academy was quite embarrassed about [the plaster versions] at the time," says Davis. "They were probably all banged against a trash can or something." In addition to the Oscar, ARA member R.S. Owens manufactures scores of other big-name awards such as the Emmy, the MTV Music Video Award and the NFL's MVP Award. Upscale awards may be old hat to Siegel now, but he still remembers the uphill battle of the early years. Siegel grew up in working-class Chicago, the son of a Romanian immigrant who rented rabbit cages, coops and other supplies to county fairs. His entry into the trophy business was a result of a last-minute errand for one of his father's customers. During the 1936 Rockport County Fair, a teen-age Siegel was given $20 to pick up two $10 trophies, but when he arrived at the store it was closed, a casualty of the Depression. Not wanting to disappoint the customer, Siegel searched the phone book for another trophy store. He ended up at a manufacturer, where he was able to get the same trophies for far less money. "Well, I only paid $12 for those two trophies and kept the rest," Siegel remembers. "It would have taken me two weeks to make that much at my job after school." Soon, Siegel identified an untapped market for guinea pig figures (since none existed, guinea pig shows used rabbit figures). He tried to convince local manufacturers to create one by exaggerating his sales possibilities: "They asked me how many I could sell and I told them 100 (I thought that was a lot)," Siegel says. "But I knew I couldn't sell that many." Still, no one was interested, but Siegel saw an opportunity he wasn't going to miss. He hired his own sculptor, had a mold made and had the figures cast himself. "I made $375 on that order," he says. "From then on I encouraged people to buy trophies from me." Siegel opened his first factory in 1940, hiring workers from a competitor. His business wavered during World War II, when metal was scarce and trophy manufacturing was prohibited. But after a stint in the Army, he began to rebuild. Siegel attributes his early success to technical innovations, such as making trophies with zinc, a much harder metal than the standard lead (he got the idea by talking to the makers of car hood ornaments). Some of his first sales were to bowling alleys, whose bowler trophies tended to break at the wrist. Siegel liked to impress potential customers by demonstrating the trophies' strength. "I'd throw them on the floor and they'd gasp," he laughs, "then they'd notice they didn't break." Siegel prides himself on insisting on high standards: "We don't push junk." R.S. Owens gradually attained semi-prestigious accounts by the 1970s. Siegel won the Oscar account in 1983, when the previous manufacturer, which was having financial trouble, recommended him to the Academy. R.S. Owens improved the process by refitting the mold and reworking the tooling. Semi-retired after 60 years in business, Siegel is visibly proud of his accomplishments. "We make such beautiful awards," he says. "Sometimes I look around and say, 'Gee, what a beautiful trophy.' "
Today, R.S. Owens is run by Siegel's son, Scott. In addition to the famous awards, the company serves many of America's top corporations, such as McDonalds and Microsoft, as well as thousands of everyday customers. In January, R.S. Owens hosted about a dozen media outlets interested in the making of the Oscar. While the Oscar brings priceless publicity, the company's bread and butter is the scouts and the schools that provide the volume orders. "I couldn't stay in business one day from the money we make on the Oscar," Siegel says. The Oscar is arguably the most widely recognized trophy in the world. The Academy's Davis attributes its notoriety to three things. First, its age: "[The Academy] was the first organization to begin giving awards in film, so the public has been aware of it since the early 1930s." Second, its status in the film industry: "I think it has retained that aura because, even if people aren't absolutely sure what the Academy is, they do know that it's the people who make movies looking at all their accomplishments for the year and selecting the outstanding examples." Third, its timeless design: "It's a gorgeous piece of sculpture with a machine-age, streamlined design that was popular in the 1920s and has managed to continue to look modern to this day," Davis says. Its popularity has made the Academy Awards an national tradition each spring, having been interrupted only three times in its 70-year history. The first delay was in 1938 when destructive floods hit Los Angeles; the second, in 1968 out of respect for Dr. Martin Luther King, whose funeral was held on the day originally scheduled for the awards; and most recently, in 1981 after the assassination attempt on former President Ronald Reagan. Every year the Academy orders 50 to 65 new Oscars from R.S. Owens, depending on how many are left over from the previous year and the number of potential winners. "We have to plan for the maximum to win in every category - a maximum assault," Davis says. More than 2,300 statuettes have been awarded since the first one was presented in 1928. Leftovers will be kept in a vault until next year's ceremony and are sometimes used to replace damaged statuettes. Recipients who request replacements are required to turn in the damaged trophy. "The only way to accumulate them is to keep doing wonderful film work," Davis says. The Academy owns many historically significant Oscars. "Often heirs of recipients will return them to us, or recipients themselves will leave instructions to return their Oscar to the Academy," Davis says. "They don't want something undignified to happen to it." The statuettes are displayed from time to time at Academy headquarters or at the nearby Herrick film library. Of course, security is always a concern when the statuettes are transported from place to place. Fifty statuettes were shipped on March 11 from R.S. Owens' Chicago factory to Hollywood by Brinks truck and a special United Airlines charter. Fortunately, none has ever been lost in transport, but there are at least a few Oscars on the lam. "We recently became aware that we lost one," says Davis. During the 1972 ceremony, two winners were called but only one was in attendance. One winner came up and claimed her award and the other statuette was left on the podium as they broke for commercial. Someone must have pocketed it, Davis says. Recently it turned up on the black market. "The Academy will make every effort to get it back," he says. The Academy is able to track missing Oscars because they are numbered, starting in 1949 with the somewhat arbitrary number 501. "[Oscars] have always been among the most valuable things that a person in this industry can acquire, but they recently have gained a secondary financial value," Davis says. This value can be attributed in part to R.S. Owens and the team of professionals who build the trophy. People often ask Siegel for his Oscar Night predictions. "I'm not a movie fan," he says, but he does watch the awards ceremony. "I enjoy seeing the recipients' faces when they receive the Oscar. And I watch when people pick it up - they don't expect it to be so heavy." It started in 1966 on a cocktail napkin--a humble beginning for the Vince Lombardi Super Bowl Trophy, one of the world's most prestigious sports awards. The scene was a luncheon attended by both Pete Rozelle, then-commissioner of the National Football League, and Oscar Riedner, then-vice president of design for Tiffany & Co. in New York, N.Y.
Riedner sketched it extremely quickly," says Ed Wawrynek, vice president of Tiffany & Co. and the firm's official historian. "And that sketch became an icon of modern-day sports--the symbol for what no one knew at the time would be one of today's most popular sporting events." The first Super Bowl, called the AFL/NFL World Championship Game, was played in January following the 1966 football season. At that time, the game was a contest between the champions of the National Football League and the American Football League. Around the third championship game, the media started calling it the Super Bowl, a title coined by Lamar Hunt, owner of the Kansas City Chiefs and founder of the AFL. He thought of the name after seeing his daughter playing with a toy rubber ball called a superball. After Super Bowl IV, the two leagues merged into one under the NFL name, with teams divided into two conferences: the National Football Conference (NFC) and the American Football Conference (AFC). The Super Bowl is now a match between the two conference champions. The actual design of the Super Bowl trophy was nearly identical to Reidner's first sketch. And since the first one was made in 1966, that design hasn't changed one iota, Wawrynek says. "That's one of the secrets of the trophy's success and durability," he adds. "It's always been the same, which makes it instantly recognizable." It was dubbed the Vince Lombardi Trophy in 1970, just before Super Bowl V. Lombardi--who died of cancer on Sept. 3, 1970, at the age of 57--was a well respected coach who had led the Green Bay Packers to victory in the first two Super Bowls. The trophy is a perfect blend of modern and traditional, Wawrynek says. Made entirely of sterling silver, it depicts a regulation football atop what resembles an elongated kicking tee--a plinth with three tapered, concave sides. "It's a traditional football, modernized by the sculpted triangular base," Wawrynek explains. At least 72 hours of labor are required each year to manufacture the trophy. "It's done entirely by hand," Wawrynek says. "It's hand spun, hand assembled, hand hammered into the base, hand engraved and hand chased." The work is done at Tiffany & Co.'s workshop in Parsippany, N.J.
Because the trophy uses a heavy gauge of silver that is difficult to bend and shape, the manufacturing process demands great expertise. First a spinner places onto a lathe a wooden chuck carved into the shape of half a football. A thick sheet of silver is placed on the chuck. With forming tools, it's spun until it assumes the shape of the chuck. After both halves are formed, they are soldered together to form the ball. "They are joined so perfectly that there's no evidence of a seam," Wawrynek says. Then a silversmith hand chases the seams and laces onto the ball so that it resembles an actual football. The base is formed from sheet stock, which is hand hammered and soldered. The football is attached by a silver rod that comes up through the base and is secured by silver nuts and bolts. "It has to be sturdy enough to hold up under handling by those 'little' football players," Wawrynek says. During the manufacturing process, the trophy must be annealed five or six times because the repeated hammering hardens the surface. The annealing loosens the bonding of the molecules in the silver, allowing it to be shaped. After the trophy is complete, the NFL symbol and the Super Bowl number are hand engraved into a sheet stock of silver, which is applied to the base. When finished, the Lombardi stands 20-3/4 inches tall and weighs about seven pounds. And while it's officially valued at $10,000, it's a priceless symbol of hard-earned victory for the players and their fans. "The trophies are a great source of pride here," says Ann Dabeck, administrative assistant for the Green Bay Packers, who won trophies from the first two Super Bowls, as well as the 1996 championship. Green Bay is one of only 12 teams in the NFL--out of a total of 30--that has earned the title of Super Bowl champion. Of those 12, eight are multiple winners. The Dallas Cowboys and the San Francisco 49ers tie for the most wins with five apiece. Immediately following a Super Bowl victory, the NFL Commissioner presents the winning team with the trophy. "Sometimes it is slightly damaged in the champagne celebration," Wawrynek says. "We always have an extra in case a catastrophe occurs, but so far nothing major has ever happened." The trophy is then returned to Tiffany & Co. for any repairs and the engraving of the team names and the final score onto the base. Then it goes back to the team for permanent possession. The teams are free to display the trophies where they want, so they end up in a variety of places. Until recently, Green Bay's trophy from Super Bowl I was on display at the Pro Football Hall of Fame in Canton, Ohio. Now the Hall of Fame has a copy of the trophy, while all three of the Packer's awards are housed behind glass in the entrance of its administrative offices, next to its pro shop. The number of fans who come to see the trophies increased greatly after the team's 1996 win, Dabeck says. The Dallas Cowboys' five Lombardis are on public display only once a year at the State Fair of Texas in Dallas. The rest of the year they are kept in the office of Jerry Jones, the team's owner. The 49ers display their five awards in the lobby of the team's administrative offices in Santa Clara, Calif. The team's marketing department occasionally takes the trophies on "field trips" such as luncheons and other promotional events. Only one championship team doesn't have its original trophy. The Baltimore Colts (who moved to Indianapolis in 1984) had to order a copy of the Lombardi from Tiffany's after Carroll Rosenbloom--who owned the team when it won Super Bowl V--took the trophy with him when he traded the Colts for the Los Angeles Rams. Although the Colts are now in Indianapolis, the team's copy of the trophy is still on display in Baltimore. In addition to the trophy, the individual players on the championship team receive custom-designed rings and a cash award, which currently is $48,000, says Pete Fierle, information services manager for the Pro Football Hall of Fame. Each player on the losing team receives $29,000--quite a hike from Super Bowl I in which players from the victorious Green Bay Packers each got $15,000, while the losing Kansas City Chiefs received $7,000 apiece. But for most players, the monetary awards that accompany a Super Bowl victory are secondary to the thrill of achieving the title of world champion. And after 32 years, the Vince Lombardi Trophy still stands as a sterling testimony to that accomplishment. "It's a wonderful iconographic symbol of sports in modern times," Wawrynek says. "In every way, the trophy is a success." showing appreciation for their loyalty. Corporate awards allow recipients to display their accomplishments and take pride in their work. Even better, an award on an employee’s desk or in his or her office makes them feel appreciated, motivated, and dedicated to doing the best job possible. Here are some suggestions for corporate awards. Plaques—Choose either solid-wood, acrylics in striking and unusual colors, or sustainable materials like bamboo. Sculptures or Art Glass—Many are now made using recyclable glass materials. Gift Sets—Golf, poker, cigar, and wine accessories are packaged in cases that feature space for personalization. Crystal—These elegant items can include cups, desk ornaments, and art crystal. Clocks—Time pieces are a classic choice and come in many shapes, sizes, and styles. Creative Custom Awards—Consult with your local awards professional to create unique recognition items that portray or reflect the intended recipient’s accomplishments. Labels: how to create a recognition program, implementing recognition, recognition examples, why give awards? There are many occasions for honoring others, be it for sports, academic, sales achievement, for retirement, or embarking on job or a new career. Many award presentations fail because they do not do justice to the individual being honored. Some are too short or vague, and others are too long and boring. Give praise that is appropriate to the occasion, but don’t be dishonest. Be as specific as possible in explaining why the recipient is being honored by listing his other community service accomplishments, projects completed, and career highlights. Demonstrate the true qualities of the recipient by making comments about what makes this individual unique or noteworthy. Ask friends and acquaintances for anecdotes or talents that should be noted. To prepare your presentation seek information from those who know him or her and share the information in a straightforward and positive manner. Most of all, make sure everyone has fun and walks away with a smile. The purpose of this planning guide is to provide the non-profit organization with some ideas and guidelines in the designing of their recognition donor wall. There are scant few resources available to help, so this discussion is of the questions that you should address before you get too far down the road. These need to be both for the recognition program in general and the donor wall in particular. What do you need these to accomplish? A lot of times staff looks at this question with a “Isn’t it obvious?” look, but if you actually get to writing these goals and objectives down, you find that every organization looks at this differently. • What are the objectives for this donor wall? • What are the policies that determine what names are eligible to go on the wall? • Are all donations acknowledged in some way, regardless of size? • How are major donors handled, both in general and in regard to the donor wall? • What do you do for donors besides the putting the name on the wall? Hand written letters, small gift of thanks, personalized art glass or plaque? • Do you have naming rights? Rooms, areas, sections or buildings? How are they tied into the donor wall? • Does the donor wall serve any other communication purpose, such as recognizing volunteers, staff, or other programs that staff may be involved in? • How will you use this donor wall as a marketing tool to solicit other donations? o New donors seeing the wall should be encouraged to picture their name up there. o Existing donors should think about cumulative donations and even moving up to the next giving level. • Do you have a separate capital campaign? • What is the space available on the wall for this display? • Is this a main traffic area? • Is potential congestion a concern? • How will the display serve to get people to stop, look at it and interact with it? • Do you have outside distractions that might impact the effectiveness of the wall, such as noise, animal areas (zoos), traffic, classrooms, weather? • How comfortable is the viewing of the donor wall? Seating, sun, interior lighting, windows, outside distractions? • What will need to be done to the background to prepare it for the installation of the donor wall? Painting or panels needed? • What is behind your donor wall? Will this present any distractions? • Lighting, electrical, IT resources available? • Vandalism Prevention: What type of environment is this donor wall in? How will this impact materials used in construction? • Other architectural or physical issues that should be raised in the planning discussion? • Past recognition elements, historical considerations, current themes – How to incorporate all these into the new design? The more information shared at this stage, the more consistent the donor wall is likely to be in regard to overall themes and messages within the culture of the organization. • Are there previous installations that you are trying to match? • Should the design be forward focused, or have a historical perspective? What is your organization known for, and how can that be incorporated into the concept? What heritage material is available to bring into the design? Do you have any historical buildings, old donor walls that have been taken down or other elements that can be incorporated into the construction? • Who is your audience? Who are you reaching out to? What is the donor experience that you are trying to evoke? What message do you want to convey? • What is the overall larger recognition picture that this donor wall will be a part of, what other issues should be made aware of in planning? • Are there any future logo changes or rebranding planned for or being discussed that could impact the design of the donor wall? • What is your message, and who will develop that? Does your content echo the rest of the organization in a consistent message? Is special content required that may necessitate outside approvals? • Who is involved with developing the donor wall? Staff, donors, volunteers, committee, board members, development manager, CEO? • Who will be providing all the text, images, video, photos, logos, graphics and other content? Do you have these available in appropriate digital format? Graphics in EPS, Name lists in Excel, Content in Word are usually best. Ask your supplier what they need. Expect typesetting to carry additional costs, the more provided digitally, the better. • Do’s and Don’ts: Colors, materials, images, finishes – what are the issues that should be avoided or must be used? • Donor Wall names: Approval of published list – who decides? How names are displayed – who decides? Proofing of list – who checks? • Is all content written and in digital format? Do you have a graphics standards manual? • Will major donors be put in a separate category on the donor wall? How many giving categories will you require? Will some categories be more prominently displayed? • Is this a closed list or an open list? Will you have a final list of names to go on the donor wall, or is this a donor wall that will be adding names over the years? How many names should be planned for? Would you like something in place of blank names? How frequently will names be updated? As donations come in, monthly, quarterly or annually? • Name Organization: will this be alphabetical, random, by date turned in, or by amount? Or some combination? If someone gives $5,000 every year for 5 years, is this a $5,000 designation or the cumulative designation of $25,000? • How do you encourage donors to move up to the next giving level? If a donor does move to the next level, does that change the location and/or size of the donor’s name on the donor wall? • If a name is to be moved, what is involved with moving the name, and who is to do that? • Will your multimedia donor recognition wall feature video, text, audio and photos? Will you use this to tell donor stories and share profiles? Will historical background or timelines be used? Should the display be interactive or self cycling? Should the display be incorporated into part of a larger display, or stand alone? • Who is providing the video content? Who is providing the copy to be read? Will the CEO, Staff or Board Members be featured in a special section such as an overview or introduction or closing statement? • Interactive Donor Recognition provides an opportunity for Donor of the Month profiles, Key Donors to tell their story, and also can incorporate the culture and history of the organization. Do you plan on adding profiles after the initial kick off? What degree of visitor interactivity would you like to see? What is the viewing distance? What size screen will be needed for the space and viewing area? • Do you require a portable multimedia donor recognition display that can be taken to special events, in a kiosk, podium, monument or other portable display? 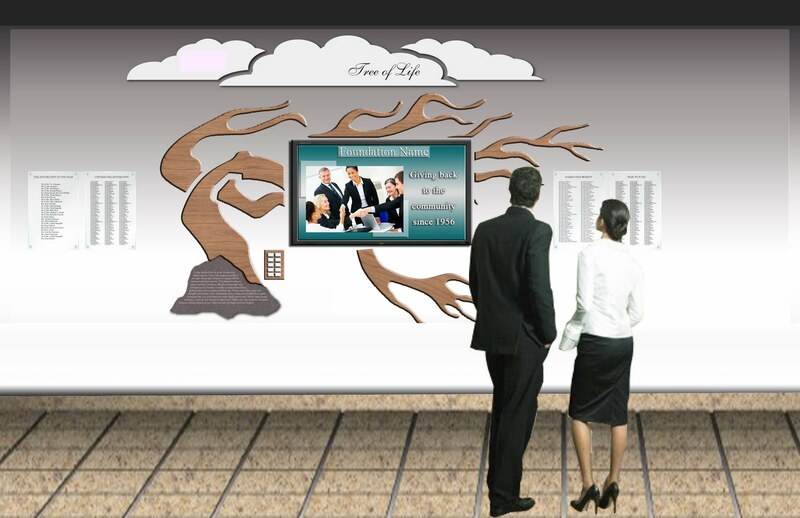 • Would a second multimedia display enhance other areas in the organization? • Should the data be also available on the website for the general public to access? • While there is no firm and fast rule on how much to budget for a donor wall project, 2-4% of the funds raised is an amount that is often used. Do you have funds available right now for the project, or are these anticipated funds? If you exceed your giving target, how does that impact your plans? If you fall short, will there be changes in what you can do for the donor wall? • Is there an old donor wall that is coming down? Are you moving the names to the new wall? Can you use this opportunity to communicate to your donors of the change in your donor wall, and how this could be a great opportunity for them to move up to the next giving level? Does your budget allow for the dismantling of the old donor wall? Who is going to do the work? • Does your budget include Campaign Consultation, Initial Design, Fabrication and Installation? Who is doing the updates and how often? Is there a budget for annual maintenance and updates? • The presentation of a donor wall is usually done with fanfare. What are the costs that may be associated with the unveiling of the display? Are there any costs associated with special events surrounding the unveiling? Are there any marketing costs that should be planned for? • During installation, are there any requirements to cordon off the area, redirect traffic or other safety concerns? How about after hours? • Will high ceilings require special lifts for installation? What is the timeline for installation? Will any other activities have to be rescheduled or relocated during installation? What other pre-installation issues are there that should be addressed? • How do you thank your donors at each level of giving? Are you consistent with each office, department, facility and location within your organization? What recognition do you give to the donor that can be displayed in the home or office? Do you seek additional ideas that will allow your organization to set itself apart from others with regards to recognition and acknowledgement? • Who is in charge of donor recognition information? Who updates the donor lists and keeps it current? Who will draft the thank you letters? Who will sign the thank you letters to donors? Who is responsible for follow-up and how is it done? Will major donors receive personal phone calls, visits, dinners, naming opportunities or other additional recognition? • How will you announce your new donor recognition wall to staff, volunteers, public and the donors? If the display is interactive, does it get updated regularly and how is that communicated? Will new staff introduction tours include the donor wall? Will visitors be shown the donor wall as part of a tour of the facility? Do you have any special events that might coincide with the unveiling of your donor wall? Is there a special date that the event should coordinate around? • Press releases, newsletters, website, e-mail blasts, in-house promotions, internal memos, media lists, blogs and announcements to AFP are a great way to get the word out. Use them all. Make sure your public relations staff is fully informed. At Robin E. Williams Incorporated all work is based on the Best Practices for Donor Recognition. Establish a family of design components to present the “face of philanthropy” within your organization in a consistent way, following traditional branding practices. ph 404.872.7646 • fax 404.872.7884 • Robin E Williams Inc.
Join our online discussion at www.thethankstank.com. For more information about donor recognition, contact RCB Awards at 800-929-9110. MILWAUKEE, WI, September 14, 2010. --- Healthcare Institutions, Universities, Zoos and Public Buildings are all well known for the displays of donor names that helped to fund the organization. But what mileage is there in a static name on a wall? At RCB Awards, interactive video displays have been added to these traditional donor recognition walls to allow each donor to tell their story. According to Curt Denevan, of RCB Awards, donors often like to talk about why they are helping the organization and hope that others will step forward to help meet the goals that are set out. He states, “Everyone likes to tell their story, with this cutting edge donor recognition display, donors can leave a lasting message for all to see”. This also allows a hospital to use the Donor Recognition Display as a marketing tool. Bringing a potential donor to the interactive display and asking them to think about telling their story is a huge asset to the organization. While a list showing a thousand names can be daunting, an interactive display allows a visitor to touch a screen and select a donor. The system then brings up the donor’s video and the story is told in the donor’s own words. 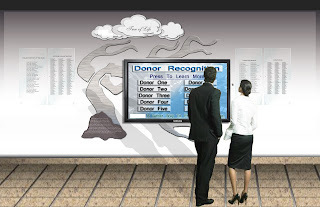 After a visitor is done selecting donor stories, the interactive system reverts to a simple display showing information about the foundation or organization. The display can also be used to list all donors, identify categories of donors based on type of contribution (endowment, capital campaign, planned giving programs, charitable trusts, or contribution levels). Interactive donor recognition is the future direction of large scale recognition. By allowing the viewer to see as much or as little information as they wish, the display becomes more interesting to them. No longer will viewers simply walk on by, the interactive display captivates all by telling the donor’s story. For additional information on interactive donor recognition displays, contact Curt Denevan or visit www.rcbdonorrecognition.com. RCB Awards is an award and recognition firm based in Milwaukee, Wisconsin specializing in non-profits and corporate award programs for the last 20 years. Recognition – It’s a Powerful Tool! How do you get the most out of it? Companies that have an employee recognition program in place have demonstrated that they know how powerful recognition can be as a leadership tool. It makes a statement to the employees about what is important to the business and what is valued by the leaders within the company. It is also one of the most effective ways to reinforce an organizations culture, support its objectives and retain top performers. While recognition is important, the way you choose to recognize an associate plays a key role in the overall success of your program as well. Where will the Presentation take place? Whether you are planning a formal or more casual presentation, the event is important and can be a powerful management tool toward developing increased commitment to the company’s vision and core values. You can recognize an associate at his or her work place, or, if desired, in a more formal setting such as a banquet hall. Whatever the setting, remember that this should be a special event for the associate and their peer group. Imagine training for long hours for a big race and then winning first place, only you aren’t allowed to tell anyone about your victory. Our achievements in life, no matter how small, are more meaningful to us when we share them with others. Keep this in mind when deciding who will be at the presentation. The event will have much more impact if the associate is recognized in front of his/her peers (and senior management and additional guests if a more formal presentation is planned). This generates excitement for others to also strive for the high goals of achievement and recognition. What will the presenter say? Congratulate the associate, say “thank you” and shake his or her hand. Remember to make the presentation upbeat, fun and to the point. Your preparation will help make the event a memorable Magic Moment for all. For more information, see: www.rcbawards.com and www.rcbdonorrecognition.com. Need to give an award, but just not sure where to start? Take a look at some of these award inscription ideas and see if that can help you. If you need more ideas, see Award Text Ideas at www.rcbawards.com. For more information, contact RCB Awards at 800-929-9110. Sometimes we are just stumped, or we don't want to be repetitive, or we just need another way to say it. Perhaps some of these common words used in an award inscription can help you out. I'm sure there are a bunch of others out there. Any other ideas we could add to the list? Walking into a hospital, one would see the donor recognition wall, perhaps the old school style with a tree and brass plates, or perhaps one of the newer more contemporary styles with corian name bars and an elaborate colorful design. But all of these traditional displays were static, you walked by and nothing really called out to you. Now there is a whole new generation of donor recognition walls brought to you by donor award experts like RCB that takes advantage of technology to not only tell the donor's story, but also to draw attention to the display and get more visitors to really lilsten to the message. Imagine walking up to a display and touching a button next to a name and having the donor tell you in his own words and image why the hospital was important in his life, why he made a major contribution, and why he is asking for others to step forward. Clearly, this is no longer just a wall, but now it is a major marketing piece, one that works all day and all night for you. RCB Awards can even take it a step further, and use touch screen displays that allow a viewer to touch a name on the screen and have it zoom out into a video of the person telling his story. While idle, the same screen can show a looping message from the Foundation about what it does. The ideas are endless. Pretty neat stuff. For donor wall ideas and trends, see: RCB Donor Recognition. For more information, contact RCB Awards at 1-800-929-9110. I recently had lunch with Beverly Peterson, Director of Development at the Waukesha Civic Theatre (WCT). At first glance, the old converted movie theater, located downtown in the heart of Waukesha, looks like a sleepy laid back little community venue. But after taking a closer look, this clearly is a very professionally run organization. When you walk in the front door the first thing you see is the main wall of the lobby that displays a huge mask, the logo of the organization, and the title Bryce and Anne Styza Donor Wall. Clearly, the organization values donor recognition as it lists all the names of contributors from two capital campaigns. The first capital campaign in 1999 renovated the building by converting it from an old movie theater to a state-of-the-art community theatre facility that is handicap accessible not only to patrons, but to performers as well. The Waukesha Civic Theatre maintained the integrity of the 1920’s movie theatre décor and incorporated it into their renovations. An additional campaign in 2006 allowed for further renovations to the north end of the building creating more rehearsal space and theatre arts education class space. There is an additional donor recognition wall in the back of the theatre building for those entering from Riverfront Plaza. In wandering around the building, one sees very quickly that naming rights are a prized commodity. Anything thing from dressing rooms, to rehearsal rooms, to even stairs are named for donors who contributed to the capital campaign. The building is named after Margaret Brate Bryant, and the mainstage is named after her daughter, Andrea Bryant Jones. These naming rights were due to contributions by family members, Tony and Andrea Bryant, as well as John Bryant during the first campaign. There are currently a few spaces available for naming rights. The Waukesha Civic Theatre annual operating budget depends on 60% being raised through season subscriptions and 40% through fundraising opportunities. This gives everyone in the community a chance to contribute, and be recognized through show playbills, WCT website and print media advertisement. . Additionally, planned giving programs provide valuable tax benefits to the donor as well as much needed income for the future of WCT. Bequests may be made through a will or other options which include charitable trusts and beneficiary designation attached to a tax-deferred retirement asset. Corporate Sponsors aren't left out either. A business or individual has multiple opportunities to partner with the theatre by sponsoring shows and events from small amounts to very substantial amounts. All of these donations come with a recognition component and it’s pretty comprehensive. The theatre is still left with a wish list from anything like audio systems, to light board, to curtains in dressing room, and everything in between. This little theatre is no little theater, but a great example of how to do recognition right, and how to realize a huge percentage of their operating budget as a result. For more information on how you can help the Waukesha Civic Theatre, please contact Beverly Peterson, Director of Development at bpeterson@waukeshacivictheatre.org or checkout their website at www.waukeshacivictheatre.org. I’ve always liked that Tom Petty lyric: “Think of me what you will, I’ve got a little space to fill.” Today, for instance. 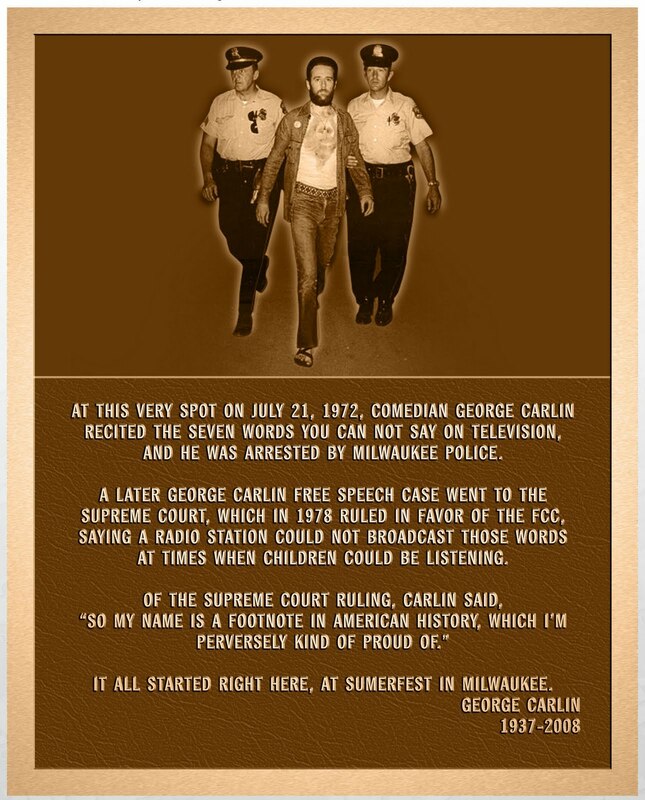 • Curt Denevan and his company, RCB Awards, ran with my idea in a recent column to mark the spot at Summerfest where comedian George Carlin was arrested. I contend it’s the most famous event in the fest’s history. The folks at RCB, 8000 W. Capitol Drive, designed some nice artwork for a plaque, framed it up and delivered it to Summerfest. They’re not asking for any payment. The firm manufactures corporate awards. 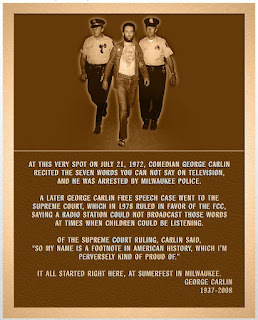 Included in the design is a photo of Carlin being led away by Milwaukee police after he delivered his bit about the seven words you can’t say on television. The photo was snapped by Mark Goff, then a freelance photographer who happened to be at the show on July 21, 1972. If Summerfest bites, the plaque would be placed in the northeast corner of the grounds, where the main stage was at that time. I got a mixture of feedback to the idea from readers. My fear is that Summerfest will wilt under the criticism from those who think marking the spot glorifies Carlin, who died in June. It wouldn't, not any more than a plaque at the spot of a presidential assassination attempt glorifies the gunman. (C) RCB Awards LLC. Ethereal theme. Theme images by Jason Morrow. Powered by Blogger.